Just for Men targets only the grey hair. Replaces it with subtle tones that match your own natural colour in 5 easy minutes. 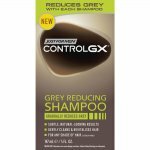 The ammonia-free formula lasts up to 6 weeks, until the grey grows out. Just for Men targets only grey. Replaces it with subtle tones for a natural look. Just for Men works in 5 minutes. And, it's as easy as shampooing. Just For Men is good to your hair. It has no harsh ammonia. Special conditioners help protect hair while you colour. It has a unique complex of Vitamin E, protein, chamomile and aloe... for thicker, healthier looking hair that's easier to control. Just For Men helps a man look his natural best, without calling attention to his hair. We have 9 natural-looking shades, each carefully matched to your natural haircolour. Backed by over three decades of research and proven over 50 million times. How often should I colour my head hair? Most men need to colour their hair about every 6 weeks - which can vary depending upon how quickly your hair grows. The best "test" for when to colour is just to look for signs of grey returning. Be sure to follow package insert instructions for repeat applications, especially if you have longer hair. Hint: to ensure that you "nip" grey head hair before it's obvious, always keep an extra box of colour on hand. How does Just For Men deliver a natural look? 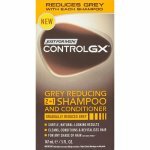 Just For Men targets only the grey hair for a natural look, leaving your non-grey hairs alone. The result is haircolour that looks like it's your own, original colour. Why should I use Just For Men instead of women's haircolour? Women's products change the colour of every hair on your head - whether it is grey or not - providing a less natural look. They also come in a variety of fashion colours, which are not appropriate for men who don't want obvious colour changes. What's more, Just For Men only takes about 5 minutes to apply versus 30 to 45 minutes. And finally, it's safer and non-damaging since it's ammonia-free, unlike most women's colour brands. Bottom line: Just For Men® was developed by men for men to match men's specific needs. Does Just For Men damage my hair? No. It's actually good for your hair. With no harsh ammonia and just five minutes of processing time, it's gentle. Plus, Just For Men® is fortified with a unique complex of Vitamin E, protein, chamomile and aloe. These vitamin-enriching conditioners protect your hair during colouring, and they make it thicker, healthier-looking and easier to control afterwards. Comprehensive, easy to follow instructions are included inside the packaging. Please read carefully before use. Ingredients can cause an allergic reaction. Do a skin test 48 hours before you use the colour. Avoid contact with eyes. Rinse immediately if it comes into contact with eyes. This product must not be used for dyeing the eyelashes or eyebrows -- to do so may cause blindness. Do not use if you have skin depigmentation problems such as white patches on your skin (a condition called Vitiligo) or if you have a family history of skin depigmentation problems, as an allergic reaction or skin irritation may cause loss of skin pigment. Aqua, decyl glucoside, ethanolamine, resorcinol, carbomer, sodium sulfate, parfum, ammonium chloride, panthenol, tocopheryl acetate, aloe vera extract, linalool.